First Friday Live Today at 12:15 p.m.
First Friday Live returns today for the second edition of a live netcast program about Wabash College. Study Abroad will be the topic at 12:15 p.m.
First Friday Live is a live netcast with social media interactive features. You can join host Howard Hewitt asking questions of the guests. Just go to the First Friday Live page and you can interact with the show's guests via Facebook, Twitter, and a chatroom feature. The guests will be two seniors who spent a semester abroad during their junior year. Keaton Becher spent time in Switzerland but has had other experiences abroad while at Wabash. He'll share his stories and take your questions. Becher is from Berne, In., a small town known for its Swiss heritage. 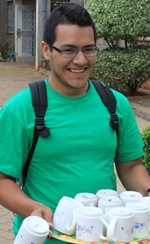 Jose Herrera, from Brownsville, Texas, has traveled to Kenya and Ecuador among his Wabash experiences. He will share his time of close interaction of the people of those two countries.